PAM Club is one of those places that once you go there, you don’t want to leave. Almost every night there’s a live performance of some sort — one night it’s jazz, the other night it’s rock another night can be heavy metal, so you never know what you’re going to get. Before PAM, there weren’t that many pubs in the city to offer you so much. Yes, there were bars that you could go on the weekends and have a beer with your friends and listen to a rock band screaming their inner body out, but what if you wanted to go out on a Tuesday night instead of Saturday night!? Well, PAM is the answer. It has all the things to make your night special and unforgettable. In the past years I’ve been living in Tbilisi, I can say that some of my best memories were created at PAM. Of course, a good club is not all about the music and the live performances. It’s also about the beers, and the cocktails! I believe there are two types of people in this world, those who love Belgian beer, and those who probably have never heard of these glorious beers. 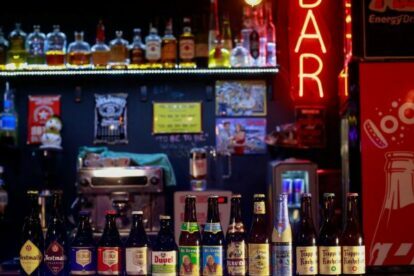 PAM club is the only place in town where you can get all the Belgian beers you would ever need in your life, from Tripel Karmeliet to my personal favorite Kwak. If you’re in town be sure to drop by one night.